Milan coach Gennaro Gatuzo is determined that his team deserves to be eliminated in the Europa League after losing his 1:3 visit to Olympiacos. We gave them the match. I`m freaked out because we could have been stronger in spite of all the incidents and getting ahead. We kept the fight in our hands, but when you have eight goals for a stadium like this one and then you lose control at the moment things go wrong, you deserve to be dropped. We showed that we are still not good enough to solve the match when we have the opportunity. It is true that there were some discussion judgments, but if you create eight positions in this atmosphere and after the first difficulty you start making stupid mistakes, then it is right to go home because we do not deserve to move on. We must not allow our opponents to enter the game and I think that the lack of experience is our biggest problem at the moment. We have to go out with desire and blaze. We gave the match. No excuses and we have to take responsibility. The atmosphere is heavy, but that should not be an excuse. Often we seem to be doing things without much faith. 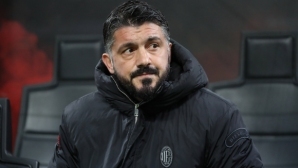 It`s like we do not want to hurt our opponent, `Gattuso said after the meeting.